Agilent Technologies has expanded its mixed-signal and digital-storage oscilloscope portfolio with two lower-cost 600-MHz Infiniium 9000 Series models, three new application packages and GPIB compatibility. The 9000 Series is the industry's first oscilloscope family to offer bandwidths from 600 MHz to 4 GHz, and it includes the industry's first mixed signal oscilloscope to support MIPI and SATA industry standards. Oscilloscopes are the primary tools engineers use to test and debug electronic designs, and engineers need increasingly broad measurement capability to deliver robust products in a timely manner. Agilent's lower-cost Infiniium 9000 Series 600-MHz models incorporate advanced viewing and analysis for debugging and testing a wide variety of traditional signals and buses used in embedded designs. In addition, they offer optional logic and protocol analyzer capabilities. In addition to extending its lineup with lower-cost models, Agilent has added new applications that capitalize on higher-bandwidth 9000 Series models. Emerging serial bus standards in the wireless mobile industry have created the need for teams to debug and test devices that meet MIPI-DPHY physical-layer standards. 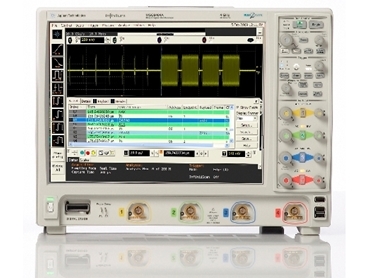 Agilent's 9000 Series is the first mixed-signal oscilloscope to offer MIPI-DPHY compliance test and protocol analysis enabling faster development of wireless mobile products employing MIPI standards. Teams can quickly move from physical-layer to protocol-layer measurements and can use the compliance application to automate testing to ensure compliance with MIPI-DPHY standards. Development teams working on electronic products that include storage may have cost constraints or legacy requirements that make SATA 1 a better choice than other interface technologies. Engineers using Agilent's 9000 Series scopes can quickly see SATA 1 information at the physical and protocol layers. For development teams using the faster 3-Gbs SATA II standard, Agilent offers both compliance and protocol support with its Infiniium 90000 Series. While LAN and USB IO have reduced the need for traditional programming over GPIB interfaces, many engineers continue to rely on programmatic interaction with oscilloscopes via GPIB. Agilent's new GPIB-to-LAN adapter enables GPIB applications on a computer to interface transparently to an instrument with a LAN interface as if it were a GPIB instrument. This adapter broadens the number of test environments that are ideal for the Infiniium 9000 Series scopes.